St Joseph's College is a co-educational independent school for day and boarding pupils between the ages of 3 and 18 in Ipswich, England. With usually 550-600 pupils on the roll, the College is situated near the centre of the town in a 60 acre campus, which includes administrative offices in the Georgian Birkfield House, a Prep School, the College Chapel, and teaching and sports facilities. Also lying within the grounds are the College’s two boarding houses, Goldrood and The Mews. The school makes use of two mottos: 'Fides labore et tenatcitate' and 'being our best'. St Joseph’s College was established in 1937 by the De La Salle Brothers, a Catholic order. The original site for the school was nearby Oak Hill. When Birkfield house was bought Oak Hill was used as the College's prep school. With the building of a new prep, Oak Hill ceased to be part of the school site. In 1996 the school merged with a girls' school, the Convent of Jesus and Mary, and became independent of the De La Salle order. However, the order retained the freehold of the site and charged rent to the school. 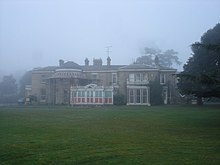 In August 2005, the school was used as the setting for season 3 of the Channel 4 historical reality show 'That'll Teach 'Em'. In 2014, the school bought the freehold outright. As a result of the merger with the girls' school, the College crest was altered. Whilst the crest had previously borne two oak leaves (reflecting Oak Hill, the original grounds of the school), and the de la Salle star, the current design has replaced one of the oak leaves with a crown of thorns from the crest of the Jesus and Mary Convent School. The College campus has evolved over the decades and still continues to do so, with a ‘Building for the Future’ programme underway. Phases 1 and 2 have already been completed, with a new Technology Centre and a state-of-the-art Sixth Form Centre. In building the latter, the College sought the input of its Sixth Formers. The College's fitness suite has also been refurbished with new equipment and an extension. Other important buildings on the site include the award-winning Prep School, featuring bright colours, rounded walls and a circular library – together with high tech classrooms. The grounds are a particular feature of the College and include many trees, shrubberies and gardens, together with a series of sports pitches and casual open spaces. The College has an Astroturf for all weather sports, tennis courts, a sports hall and a dedicated changing room block/PE office. St Joseph’s is known as a centre of sporting excellence. Birkfield House takes its name from the Georgian building of the same name found at the centre of the campus. Birkfield House was the original building that the school moved into in 1946. Birkfield Mews is the name of one the two boarding houses on campus, but it is more commonly known as ‘The Mews’. Goldrood House is named after ‘The Gold Rood’ house and estate, which the school acquired in 1963. The mansion, built in 1811 is now home to 50 boarders, having previously been the home of the Prep School. Prior to the Mansion’s existence the land held an ancient and celebrated cross - or rood - erected in monastic times. La Salle House is named in honour of the College’s patron saint, John-Baptist de la Salle (1651–1719), a French priest and educational reformer who spent his life teaching poor children in parish charity schools. Saint John-Baptist is also the patron saint of teachers. Orwell House takes its name from the River Orwell flowing through Suffolk. The river, whose name dates to pre-Celtic, remains central to the lives of the people of Suffolk and beyond. Not only key to trade, the River Orwell inspired artists such as Constable and Gainsborough. Many believe Eric Arthur Blair took his famous pen name (George Orwell) from the river. Arthur Ransome (Swallows and Amazons) spent much time on the river fuelling his creativity. Covenants existed on the land between Goldrood and the River Orwell preventing obstructions to the river view. The College offers full, weekly and flexi boarding and its boarders come from both the United Kingdom and overseas. Goldrood house is used for younger male boarding students and The Mews for female boarders as well as Sixth Form boys, with separate sleeping areas. The National Schools Rugby Festival was started in 1986 to commemorate the Golden Jubilee of the College. It is now the country’s premier schoolboy 15-a-side rugby tournament. Schools invited to take part come from both the state and independent sectors. The Festival has a track record as a proving ground of future stars: former England captain Chris Robshaw, British and Irish Lion Mako Vunipola, England winger Charlie Sharples, and Zach Mercer, Player of the Tournament 2014, who went on to help England to the World Rugby U20 Championship in June. Mike Tindall is another who trod the St Joseph’s turf. Jonathan Joseph was named Player of the Tournament for Millfield School. The most recent success is Marcus Smith, who was named Player of the Tournament for Brighton College in 2016; a year later he and Zach Mercer are Eddie Jones' apprentices in the England Training Camps. The Rugby Festival is streamed and watched online by tens of thousands. Attendance at the weekend festival also runs into thousands. The annual St Joseph’s College Arts Week in June grew from a one-off lunchtime concert in 1996. It is now an important feature of the school’s summer calendar, with timetabled lessons given a creative spin and a programme of special events and activities, ranging from jewellery workshops to poetry readings. Headline events include lunchtime concerts, the Prep School and Lower School productions, Rock in the Quad and Unplugged. The Festival also includes a photography competition open to students and non-students (up to the age of 25) alike. Throughout Arts Festival students are encouraged to get creative and the week usually buzzes with spontaneous ‘pop up’ happenings and performances. One of the most notable buildings on the campus is the College Chapel. Built in modern style, the Chapel design echoes the form of a tent, like those used by the Israelites whilst they were in the desert. In 2017, just as the Chapel reached its 50th anniversary, serious flaws in the roof were discovered. The building was temporarily closed whilst detailed investigations were begun. The College is currently considering the best way forward to repair the Chapel. In the meantime the school's former library has been refurbished as a general meeting and assembly space, and renamed The ARC, reflecting the College's three key values: Aspiration, Respect and Confidence. The Old Birkfeldians is the Alumni Association of St Joseph’s College. It is named after the site of the original school (Birkfield House). It has been merged with the Alumni Association of the old Junior School (Old Oakhillians). ^ a b c d e f g "Senior Prospectus". St Joseph's College. Retrieved 7 October 2017. ^ Roth, Andrew (16 March 2001). "Chris Mullin". theguardian.com. Retrieved 14 March 2014. ^ "Obituaries: Earl Nelson". The Daily Telegraph. Retrieved 7 October 2017. This page was last edited on 15 February 2019, at 00:14 (UTC).